Since Spaceballs first parodied Star Wars for its mammoth merchandising push, George Lucas' firm missed no opportunity to stick a Star Wars logo on something and add 50% to the price. New Star Wars owner Disney has been slower to jump on the brandwagon, and this HP Star Wars tie-in illustrates a more careful approach to brand exploitation. Though the underlying laptop (a HP Pavilion 15 or equivalent) isn't much to write home about, the job that HP has done on the design is very nice. Mingling a modern distressed silver style with classic icons of the series and careful colour-coding, it feels like very sinister laptop indeed - right down to the red glow of the keyboard and the Death Star trench run gloss on the touchpad. We're totally sold on the look, and the care taken on the packaging is impressive - there's even moulded plastic tie bombers embedded in the foam! Notably, though, HP and Disney haven't added meaningless extra dollars on for the branding. This is still a cheap laptop and isn't much more expensive than the base HP laptop. The US, UK and Australian models are all subtly different, with the US having several to choose from including a touch-screen model, the UK having the lowest spec model with an added mid-spec Nvidia graphics chip, and Oz getting a mid-range version. Despite all that, the specifications of this model aren't wonderful. It's got a ultra low-powered Skylake processor, with a built-in graphics chip and an extra Nvidia one too. 6GB of RAM is a bit tight, and the slow 1TB hard drive isn't anything to write home about. But, every other box is ticked - a nice range of USB 2.0 and 3.0 ports, HDMI, an SD card reader, a HD webcam, wireless, bluetooth, and even an old-fashioned optical drive, in case you want to watch some reel-to-reel movies. It's a 15-inch laptop, meaning it's 15 inches across. However, due to the miracle that is trigonometry, it's got a 15.6-inch screen. How these science-magicians manage to cram that extra 06” into the diagonal is a mystery of the ages. Beyond that it's a reasonably light and robust feeling machine, presumably down to its mainly plastic body. The screen has a slight give to it, but nowhere near as flimsy as many ultrabook screens. Inside, there are nice decals and images from Stars Wars scattered all along the machine. There's a bit of Aurabesh text on the machine's spine saying 'Galactic Empire', a few errant Stormtroopers wandering around the keyboard backing, and old Darth the Vader popping up on the screen back, looking down on you for enjoying the third movie just because his legs get chopped off. The display is perfectly adequate, a 1080P screen with a matte finish that looks good in most light. 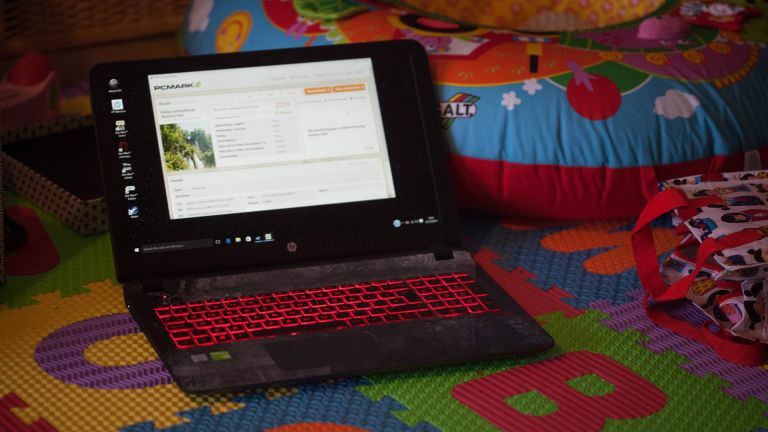 We suspect that the integrated graphics chip has been included just to run this screen resolution, as the standard HP Pavilion has no chip and half as many pixels on its 1366x768 screen. The built-in Bang & Olufsen speakers do well with most soundscapes, though they seem a bit fluffy in the mid-range. The heart of this machine isn't its hardware, howsoever dolled up in Vader togs it might be; it's the software. Included with this machine is an absolute ton of Star Wars memorabilia, ranging from novel excerpts, to screensavers, to an old Star Wars comic, to new sound themes (we love the lightsaber one) to rotating backgrounds, to huge amounts of old photos from the films. None of it looks expensive, and a lot of it is upselling something else, but it really does give a feeling of fandom to the thing. I mean, they've replaced the recycle bin with the Death Star - and when you empty it, it makes a silly noise, and is replaced with the half-built Death Star 2! The Star Wars Special Edition might look as handsome as Harrison, but it has the agility of Chewie. It performs adequately across most functions, whether that's video, web browsing, word processing, spreadsheet editing… it just has issues with anything more intensive, despite the inclusion of that Nvidia mobile chip. For gaming, it can just about manage to run anything low intensity 3D - like Lord of the Rings: Shadows of Mordor - on low to medium settings. We can't praise this battery. There's no "enough" on the end there; we just can't praise it. For some reason, we only managed to get a maximum three hours of life out of it running benchmarks before we had to plug it back in. We'd expect 4-6 for a normal laptop, and wouldn't personally buy anything that wouldn't last a working day. Beyond the problematic battery life, this is a solid laptop with a nice approach to its theme for very little extra money. In future models, we want to see a bit more variety; a top-end ultrabook with a proper steel build would be attractive, as would a laptop based on the Rebel designs rather than the black, silver and red of the Galactic Empire. For now, we can't quibble with fans who want this for the branding - it's really well done - as long as you're not planning to use it on the move too much.